A deque is a double-ended-queue. A double-ended-queue is a linear collection of elements that supports the insertion and removal of elements at both end points. The Deque interface is a richer abstract data type than both Stack and Queue because it implements both stacks and queues at the same time. 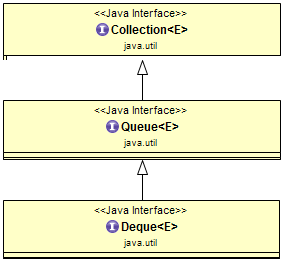 The Deque interface defines methods to access the elements at both ends of the Deque instance. Methods are provided to insert, remove, and examine the elements. Predefined classes like ArrayDeque and LinkedList implement the Deque interface. The addfirst and offerFirst methods insert elements at the beginning of the Deque instance. 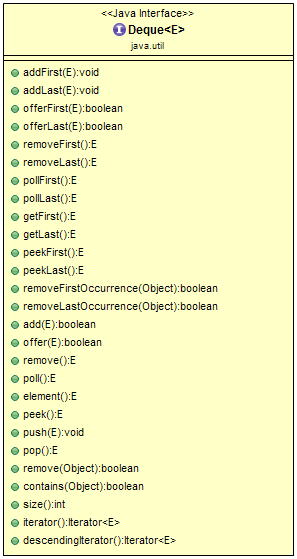 The methods addLast and offerLast insert elements at the end of the Deque instance. When the capacity of the Deque instance is restricted, the preferred methods are offerFirst and offerLast because addFirst might fail to throw an exception if it is full. The removeFirst and pollFirst methods remove elements from the beginning of the Deque instance. The removeLast and pollLast methods remove elements from the end. 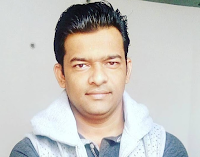 The methods pollFirst and pollLast return null if the Deque is empty whereas the methods removeFirst and removeLast throw an exception if the Deque instance is empty. The methods getFirst and peekFirst retrieve the first element of the Deque instance. These methods don't remove the value from the Deque instance. Similarly, the methods getLast and peekLast retrieve the last element. The methods getFirst and getLast throw an exception if the deque instance is empty whereas the methods peekFirst and peekLast return NULL. Below diagram shows a list of APIs/Methods that deque interface provides.